Start off your day with breakfast at the Writer’s Bistro located 31 Woodfin in the Renaissance Hotel. ‘Inspired by North Carolina’s rich literary history,’ breakfast selections include a BLT with eggs and avocado, or a Goat Cheese Skillet with apple sausage. 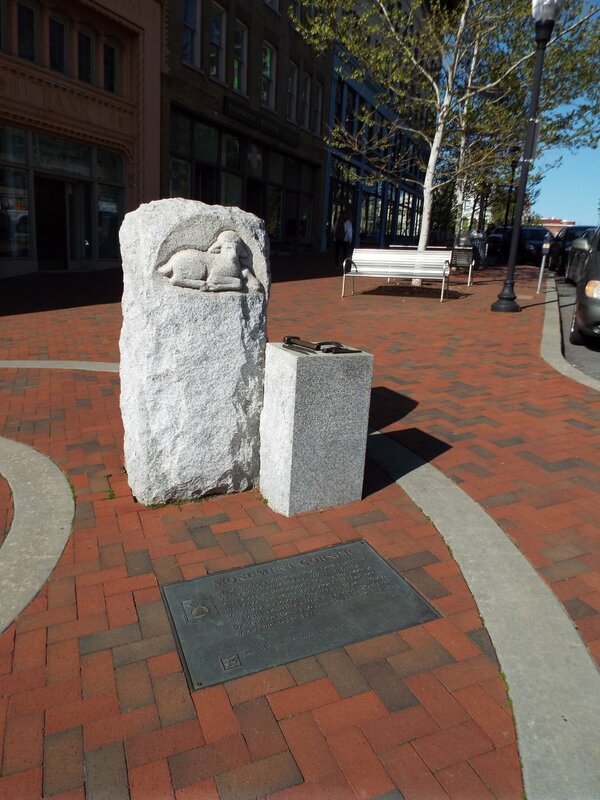 Directly across from the Renaissance, the Thomas Wolfe Memorial is a state historic site dedicated to the author of Look Homeward, Angel. Published in 1929 the novel was an autobiographical coming-of-age story that hit a little too close to home for many Asheville residents, causing a local scandal. Wolfe’s literary celebrity later redeemed him and he visited Asheville in 1937 just before his untimely death in 1938 at the age of 37. His legacy lives on throughout the town. You can tour ‘Old Kentucky Home,’ the boarding house owned by his mother that Wolfe lived in for much of his childhood, which is illustrated in his novel under the name ‘Dixieland.’ In the novel Asheville is known as Altamont, and you also will see that reference throughout town, including the apartments near the historic site. There is a Visitor Center with a museum and a movie, and a tour of the site is $5 and well worth it, especially to get a feel for the history of Asheville and its deep roots in tourism and the treatment of tuberculosis. After your tour take a walk through downtown and visit all the other Wolfe memorials - his towering outline and a replica of his footprints in front of the Altamonte Apartments at 72 N. Market Street, a monument to his father’s Tombstone and Monument shop in front of the Jackson Building at 22 S. Pack Square, the replica angel in front of the old Pack Library (now the revamping Asheville Art Museum) at 2 S. Pack Square, and the Thomas Wolfe Memorial Auditorium at the U.S. Cellular Center 87 Haywood Street. While you are searching for these monuments, stop at one of our amazing local independent bookstore to pick up a Wolfe novel (if you didn’t already get one at the Visitor Center), or a book from one of the many other regional authors like John Ehle, Charles Frazier, Gail Godwin, Heather Newton, Denise Kiernan, Terry Roberts, John Parris, Wilma Dykeman, Patricia Cornwell, Sarah Gruen, Ron Rash, Sarah Addison Allen, Wiley Cash and/or Lee Smith. Downtown Books and News, located at 67 N Lexington, are ‘Purveyors of Used and Rare Books.’ Their sister store, Malaprop’s, at 55 Haywood Street, is hands-down one of the best bookstores in the country, and has been voted as such by Publisher’s Weekly, Travel and Leisure, Our State, and others. Their selection is top-notch, and if you’re not sure what you’re looking for you can visit the ‘blind date with the bookseller’ section. There is an extensive regional authors section, as well as a cafe. They have events almost every night of the week, and pull in some very impressive authors. It is also a great place to get signed editions of books if you’re looking for a very special present for yourself or someone else. Captain’s Bookshelf at 31 Page Avenue has been in downtown Asheville since 1976 selling rare and secondhand books. If you’re looking for signed books, beautiful leather bound or rare editions, collectible books, or other interesting finds the selection and service at Captain’s will help you find what you need. Across the Street in the Grove Arcade visit the Battery Park Book Exchange and Champagne Bar at 1 Page Avenue. This place has the best ambiance in Asheville - a rambling two story used bookstore with a hidden enclaves and tons of comfortable sitting areas, along with great wine and delicious cheese trays. It is full of lots of surprise finds so take your time browsing. Alongside the Battery Park Book Exchange runs O.Henry Ave. Named after the famed short story writer William Sydney Porter who wrote under the pen name O. Henry. Porter wrote over 400 short stories in his brief lifetime, becoming famous for his surprise endings such as his most popular story “The Gifts of the Magi.” In 1907, after losing his first wife to tuberculosis in 1897, 45 year old Porter married his childhood sweetheart Sarah (Sallie) Lindsay Coleman, who lived in Weaverville. Porter relocated to the mountains in the hopes of improving his failing health. Weaverville was too quiet for Porter, who had grown accustomed to living in New York City, so he took an office in downtown Asheville. The couple separated in 1908 and Porter returned to New York. In 1909 Coleman left him, and in July 4 1910 at only 48 Porter died of cirrhosis of the liver, diabetes, and an enlarged heart. He is buried in Riverside Cemetery Asheville at his second wife’s request. In 1916 Sarah Lindsay Coleman published a book, Wind of Destiny, a fictional portrayal of the courtship between her and O. Henry. For lunch head north of the city to the Omni Grove Park Inn and grab a beer and a burger at Edison Craft Ales + Kitchen or a salad and glass of wine at the Sunset Terrance - either place has incredible views of the mountains and downtown Asheville over the renown spa and golf course. Located on Sunset Mountain in the Grove Park neighborhood of Asheville, the Inn has literary legend because of the two summers F.Scott Fitzgerald spent in 1935 and 1936 at the Inn. He was only 36 years old but his writing had waned during this time and he struggled with alcoholism, trying out a ‘beer cure’ of drinking upwards of 50 ponies (7 oz beer) a day in room 441 and 443. Fitzgerald’s life mirrored America - he epitomized the roaring twenties in his life and his writing, publishing his greatest works, This Side of Paradise (1920), The Beautiful and the Damned (1922) and The Great Gatsby (1925). In the 1930s he sunk into the Great Depression, struggling financially as well as physically and mentally. His wife Zelda was at Highland Hospital across town in Montford being treated for her own personal struggles. He published one last novel in his lifetime, Tender is the Night, in 1934. During his time at the Grove Park Fitzgerald wrote a magazine article for Esquire, published in three parts in February, March and April of 1936 and later combined and released as a book titled The Crack-Up. Fitzgerald died just a few years later in 1940 at the age of 44 from a heart attack. As you walk through the Great Hall of the Omni Grove Park Inn notice the inspirational quotes, many by famous writers like Emerson and Thoreau, that grace the stonework in the Hall; their inclusion in the fabric of the inn was on the behest of the owner E.W.Grove’s son-in-law Fred Seeley who designed the Grove Park. At 53 Birch Street in the Montford Neighborhood you'll find Riverside Cemetery. With 87 acres of rolling hills and flower gardens alongside the French Broad River, Riverside Cemetery is a great place to take a walk and pay tribute to Thomas Wolfe and O.Henry, who are both buried within its grounds, along with George Masa, a famous photographer of the Great Smoky Mountains, who has a mountain named after him - Masa Knob. Many other notable Ashevillians are buried in this cemetery, including the governor of North Carolina during the Civil War Zebulon Vance. Loop back downtown for dinner and drinks at Hemingway’s Cuba, one of Asheville’s newest rooftop bars inspired by Hemingway’s favorite restaurant in Havana, for a daiquiri and some ropa vieja. Hemingway never visited Asheville, but he did stay at the Pine Crest Inn in Tryon on a hunting trip. George Vanderbilt was a well-known bibliophile. His library in the Biltmore house is home to over 22,000 volumes that Vanderbilt had bound by specific binders in impressive moroccan leather with gilt lettering and decoration. Vanderbilt read an average of 81 books a year, logging over 3,000 in his diary before his death at the age of 52. George collected not only for himself, but for all the guests that visited the Biltmore House, guests who included Henry James and Edith Wharton. Vanderbilt was also very good friends with Paul Leicester Ford, a noted author whose life was cut short by his own brother in his New York City home. Ford stayed at the Biltmore Estate multiple times, helped arrange the marriage between Edith Stuyvesant Dresser and George, and dedicated his most well-known book, Janice Meredith, to Vanderbilt. Entrance to Vanderbilt's Library with his portrait holding a book. The Carl Sandburg Home is a National Historic Site located in Flat Rock just 30 miles South of Asheville. Called the ‘Poet of the People’ Sandburg won three Pulitzers, two for his poetry and one for his definitive biography of Abraham Lincoln, which he spent 30 years of his life collecting the material for the 6 volume book. After he died in 1967 his wife gave his Flat Rock house and land over to the government as a National Park, preserving the site exactly as it was in the 1960s, including 264 acres of pastures, ponds and hiking trails, and the goats his wife was renown for raising.